Every day, chemists are working to improve life in the world. Whether it's testing new drugs to cure disease, or looking for ways to protect our environment, we're making our mark on the world. Learn from our expert faculty and grow in service, part-time employment and leadership. Get the one-on-one attention you need to excel in your career path. Our program sets itself apart by being distinctly Christian — with a plethora of research opportunities. 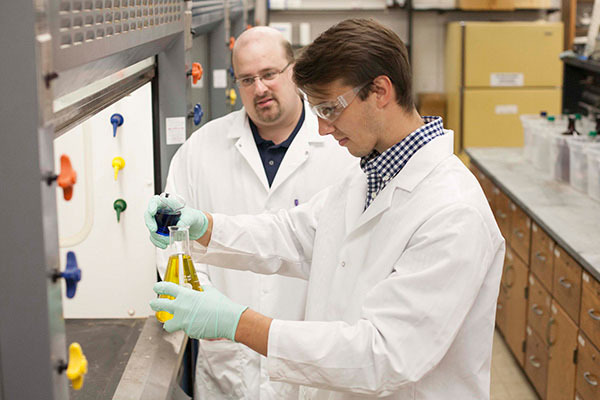 We provide flexible emphases for our applied chemistry major, from computer science or mathematics to business, green chemistry, environmental chemistry and forensic science. The applied path is perfect for those who want extra flexibility and the option to pursue diverse emphases that align with your niche. Join our distinguished graduates in every sector of chemistry, from the industrial sector to nonprofits, government and education. For example, you could earn required pre-pharmacy requirements while gaining the business skills you need. And if you choose the professional chemistry major, you’ll be in good company. It has a history of Lipscomb graduates with prestigious careers. They generally wind up in industrial or academic research, at such organizations as BP America, NASA and Conoco-Phillips. So upon graduation, no matter what path you choose in chemistry, you’ll be ready to start your career in the chemical industry — and to take your pick of job offers. Approved by the Committee on Professional Training of the American Chemical Society (CPT-ACS). Students who complete the Professional Chemistry degree and Biochemistry (CM 3313) are eligible for certification as a chemist by the Committee on Professional Training of the American Chemical Society, the largest scientific society in the world and the recognized international authority on the education of chemists. Want to be a chemist? This path is for you. You'll go beyond the basic principles of chemistry, learning the complex fields of organic, inorganic, physical and analytical chemistry. Plus, you'll have special courses designed for research and intensive specialized and integrated labs. If the teaching field is your path, you'll gain an excellent background in chemistry as well as the educational knowledge you need to prepare for your own students. Chemistry teachers are in demand. Our students are regularly recruited. They move on to be educational administrators — headmasters, principals, and assistant principals. You'll be well connected to alumni in the field of forensic sciences. What we teach will qualify you to work in a crime laboratory, or get a job in drug testing. You'll be in an ideal situation in Nashville; one of the scientific employers here is a national industry leader in drug analysis. And with the opportunity to take electives in political science, psychology or Law, Justice and Society, this emphasis provides a well-rounded education. Gain expertise in accounting, economics and finance with an emphasis in business. You’ll have the chance to learn from experienced faculty who understand what skills you need to succeed. Take your talent to the next level with our computer science emphasis—for more information, please speak to our department chair. Choose the environmental chemistry emphasis and you’ll have excellent preparation for becoming an environmental laboratory professional. Our green chemistry emphasis is one of the few curricula in the U.S. at the undergraduate level. With it you’ll find new, safer, and more efficient ways to perform chemical reactions. Having trouble choosing just one degree? Apply your chemistry knowledge to high-level math courses, creating a unique concentration that will doubly serve you in your field of work. Student teaching is required for Chemistry Teaching majors. German is highly recommended as the foreign language for the B.A. option. These subjects constitute the student's minor. The chemistry department will consider proposals from students who wish to emphasize areas other than those listed above. This will be done in consultation with the academic chair. The area selected must be one which will compliment the student's academic progress and professional goals. Omit CM 1013, MA 1043 and PH 1013. BY 1003 is included in specialized subject matter. Chemistry teaching majors have a built-in minor in education and are not required to take another minor.